Years ago we had a drawing for orphan lotto blocks. Blocks that were rejected for because of color, size, just not right. I won a batch. 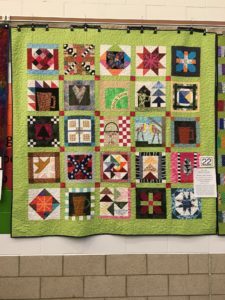 This is hanging at our local quilt show this year. I finally finished it. Sometimes I left them as is and added framing. Other times I cut added to them. It was fun to put together.